Welp. We've finally had a Scootaloo episode! And I'm happy to say that it more than fit my expectations. We got to see Luna in her most prominent role since the beginning of S2 (and a lot of people weren't satisfied with that episode), as well as some insight into one her royal duties (Dream Guardian, or some such). We got a nice addition to RD's character near the end, which may do some good to quelling all the hate surrounding her usual arrogance (plus, the fact she can literally level trees with a single kick is kinda freakin' amazing). Plus, the issue of Scootaloo being the only CMC without someone to truly look up to has finally been addressed (and I will be severely disappointed if we don't see some consistency with this fact in future episodes). Also, random note: I'm starting to realize that--while I still dislike her character--Rarity is really hilarious and adorable. So, yeah. There's that. Luna is benevolent Freddy Krueger! something I forgot to mention, and I'm surprised no one else has: why was Sweetie Belle's singing so bad? was it because she was tired? Yes! I was wondering why she sounded bad. While I don't have an explanation as to why she was, it's now in my head cannon that that might be the reason she doesn't have her cutie mark yet. what, she can't sing well on a consistent basis? If Sweetie Belle sang well this episode, it'd be less funny. That was a good episode! I liked seeing Luna again, and focusing on Scootaoo was great. I think the fanon of her being an orphan is pretty darn believable at this point. Also, was it just me or was there more visual humor in this episode than usual? The show can end now, I'm good, this is all I wanted. IAlso, was it just me or was there more visual humor in this episode than usual? The episode had a new writer, that might be the reason. Not that, more like she hasn't taken her singing seriously enough that she cares it sounds good most of the time. I feel that Applebloom should have sung there anyway. Maybe she just needs to develop her skills a little more. Then she can earn her cutie mark. She seemed to be overly excited while she was singing. Maybe that was the problem. I think the main reason she didn't sing well is because 99 Bottles of Beer on the Wall (or in this case, Buckets of Oats) is more of a chant than it is a song. I mean, when you've got adults singing it, there tends to be a little musicality to it. But with kids? They don't care how they sound, so they just scream it as loud as they can. And that's what Sweetie did. I'll admit I wondered the same thing when I was watching the episode, but it actually makes a lot more sense to do it the way they did. Although I do think it would've been hilarious if they'd somehow turned 99 Bottles of Beer on the Wall into a drawn-out emotional ballad or some other such nonsense, but the way they did handle it was still pretty fantastic. Especially with Sweetie Belle instantly conking out at the end (which I have a feeling is in reference to the way kids tend to be incredibly loud and obnoxious on long trips, but as soon as things die down you have the inevitable crash where everyone just falls asleep). It would've been slightly better, though, if Applebloom and Scootaloo had joined in (at least for a portion of it). I thought that she sounded bad because the song of 99 bottles is an annoying song. Just watched the new episode with my brother, time to chime in with my thoughts. I think I might have a new favorite episode. The music here was awesome, especially for that second-to-last scene with Rainbow Dash helping Scootaloo fly. The humor was fast and furious, with so much stuff happening on-screen at times that I had to rewind a couple times just to take it all in. I never thought I'd laugh so much at Sweetie Belle pulling a luggage-filled cart. That sequence with Scootaloo asleep on her scooter and going through all those hazards was amazing, especially with how it ended. Also, that whole sequence near the end with Scootaloo running away, hanging by a branch, getting swept away by the river, and falling over the waterfall, clearly to her death if not for Rainbow Dash, was surprisingly intense. Yeesh. And of course, seeing Luna again was great. Changing gears slightly, is it just me, or have the lessons this season been a bit more... I don't know, mature? Cerebral? I'm not sure what the right word is. But I mean, Crystal Empire was about self-sacrifice, Too Many Pinkies was about knowing when you have to choose which friend to spend time with, One Bad Apple was about speaking up rather than becoming a bully yourself, Magic Duel was... I don't know, tyranny is wrong or something. And this one was being honest about your fears so that they don't freaking murder you via waterfall. Not just that, but I felt a theme throughout the episode of Scootaloo's loneliness, whenever they showed Apple Bloom and Sweetie Belle being comforted by their sisters, and then showed Scootaloo on her own. I don't know, it just seems like something the especially-younger viewers might have trouble with. I'm overthinking this again, aren't I? No, I would say that is a very apt analysis of the episode. While I am posting, here is a song about the most METALpony that ever was! He might give Rainbow Dash a run for her money in speed. He's from the Norse pantheon, but I think he would fit into the ponies semi-Classical Greek world! Pinkie Pie wrote one at the end of Too Many Pinkie Pies. and that was the only episode so far where it was really necessary. Celestia was actually present at the end of Crystal Empire and Magic Duel, and the other two have been CMC episodes and they aren't required to write to her. That is true it hasn't really been necessary for anyone to write one except Pinkie Pie. Who knows maybe the CMC can write to Luna instead I think that could be a nice way to add something to the CMC episodes and maybe give Luna some more screen time. There's only been like one actual friendship report, but there have still been verbalized lessons at the end of the episodes. Which in itself is rather interesting. Perhaps we're to assume they write the letters down to be sent in later? Edit: something else I've come to while thinking over this essay. At first having Princess Luna in the episode seemed like fan service. Then Luna explained that watching over dreams is part of her powers. But that didn't really explain why she was in Scootaloo's dream in particular at THIS particular time. But then, it dawned on me that Luna pre-Nightmare Moon and Scootaloo in this episode have a surprising amount in common. Both are suffering from loneliness and fear. Scootaloo wants to have a loving sister-figure in RD and was fearing her rejection, while Luna had a sister by way of Celestia, yearned for love from her subjects during the night, and feared never getting it. 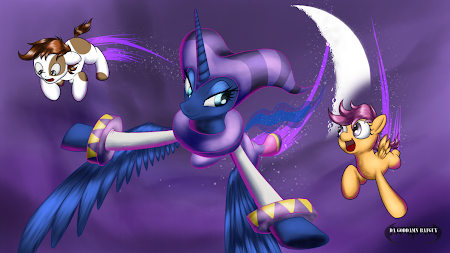 So here, Luna saw Scootaloo was going through something similar and stepped in to help. It turns out that they are now into their third printing of the My Little Pony comic. Since my comic shop failed to obtain the first printing for me I had to get it off amazon for around $10. I know that is almost three times the cover price, but it is worth it and makes me feel better about putting up with my shop's incompetence and severe lack of customer service. I just hope that they can get the box set in. Of course it is on sale at midtown comics. Buying a comic book should not be this complicated. A lot of people has been saying that Luna was just fanservice. I agree with you on the explanation of why she helped Scootaloo. I think that Luna chose to enter Scootaloo's dreams this time because the horror stories were adding up to her fear of having a big sister figure to the point of giving her great torment in her nightmares. It amses me how some people think that it's pure fanservice when a character is given a bigger role in the story. It'll be fanservice, thou, if they start making Lyra voicing that she has the desire of being human. Considering that the Trixie Episode was not in anyway connected to the Fandom (it was originally going to be an early season 2 episode, so the idea had been thought up some time during mid season 1 IIRC) almost any incident that people think is Fan Pandering is in fact not. Truth be told the people who do think that are really annoying and use it as a reason to hate an episode instead of coming up with real reasons. Last edited by IceKitsune on Mon Dec 10, 2012 7:54 am, edited 3 times in total. Agreed. If Luna had been something like Derpy is (like "let's spot Luna in the background") then I might have agreed it was fanservice, but they gave her a role (and a good one that fits her character well). edit:Before anyone points it out, I'm not against Derpy nor fanservice, as long as it gives a purpose to the story. Third printing? Seriously? Most comic runs these days, including Marvel and DC, don't even sell off all their first printing. almost any incident that people think is Fan Pandering is in fact not. Derpy getting major screen time and a voice sure didn't happen because DHX thought "Why not" But it's unlikely to ever happen again. This is exactly why I was so mad when the comic shop lost my comics. I knew that it would fly off the shelves like that! Well, time to share with you all my crazy thought of the day I had while walking the dogs. The alicorn amulet is a Horcrux. That is all. That's why I said "Almost any incident" and not "every incident" since Pandering has happened before just not as much as people actually think. Well it acts similarly, I guess! Maybe Horcruxes were an inspiration. 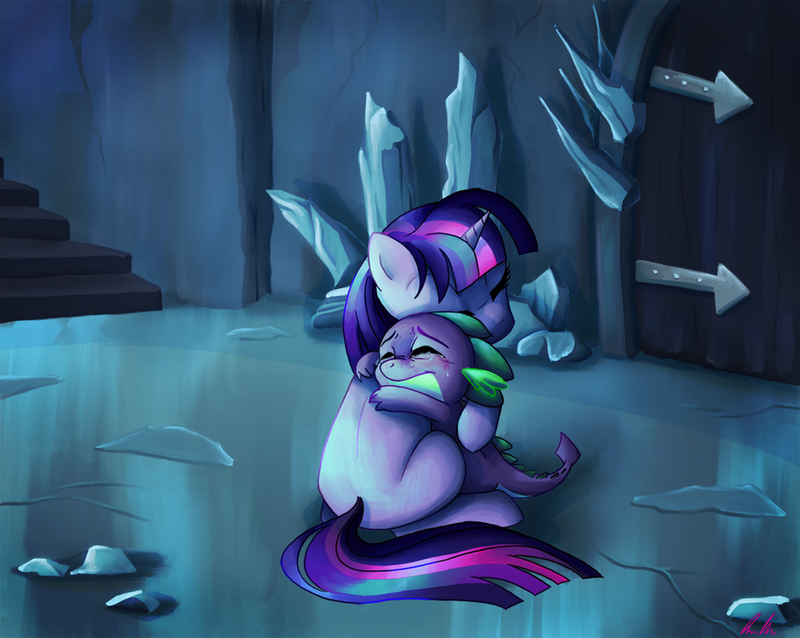 I still think that amulet belonged to King Sombra. I hope they revisit it in a future episode. The description of the next episode has Rainbow Dash at the Wonderbolts training academy. I have a feeling it will be the Grand Galloping Gala all over again. Or maybe they will haze her endlessly. Found this on tumblr and it almost made me spit up my drink. A wonderful bit of nostalgia re-worked as ponies! 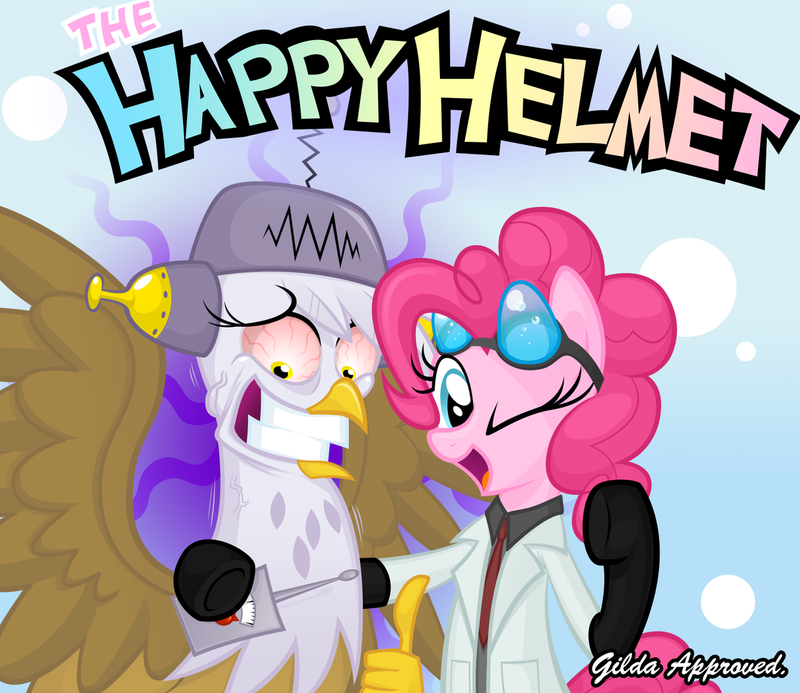 "Its the Happy Helmet, Gilda! Now you will always be happy! And this is the remote control! And I use this dial to control how happy you are!" Oh wow, that is amazing. Edit: on a different note, I wonder how long it will be until the new trailer for Man of Steel gets ponified. Those last two photo's are amazing! I don't know why but I'm surprised someone's made a Ren and Stimpy reference. Does anyone feel like the animation changed in that episode. It seemed more squash and stretch than usual. give her a break, she spent the last thousand years on the moon. It was still new back then. She did it first. I have to admit that I'm kind of a bit annoyed how people keep comparing Luna to Freddy Kruger now that we know about her dream powers. I get that hes the most popular character that has dream based powers but come on people there are others, you know ones that aren't psychotic murderers and who's purpose of using their powers are much more like Luna's. Dream of the Endless from DC/Vertigo and NiGHTS from Nights into Dreams to name two that come to mind right away. NiGHTS from Nights into Dreams to name two that come to mind right away. Yeah, but making her kill people is cooler.